Training centres for school cooks are being launched across England to ensure primary school lunches meet strict new nutritional standards. The centres will help on-site caterers improve their skills so they can cook healthy meals from fresh ingredients. The network is a part of a government drive for better school food triggered by TV chef Jamie Oliver's campaign against junk food three years ago. Children's Secretary Ed Balls said good cooks are central to children's health. Mr Balls said: "School cooks are the heartbeat of our school food revolution - transforming lunches and children's health. "They deserve the best training. 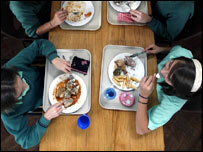 They do highly-skilled jobs giving millions of children nutritious dinners every single school day. "These centres and our continued funding means they can brush up their skills or learn new ones, so they can prepare meals for their whole schools from healthy, fresh ingredients." The battle for better meals in schools was brought to the public eye when Jamie Oliver revealed the shocking state of children's diets in his 2005 television series, Jamie's School Dinners. It showed classrooms of children who were addicted to chips and unable to recognise a leek. The dinner ladies were monotonously opening packets of processed food, rather than cooking nutritious food from fresh ingredients. Oliver's campaign, along with pressure from parents and other pressure groups, led to former Education Secretary Ruth Kelly's pledge to put £280m towards school dinners. In November Oliver criticised the government for failing to honour its promises on healthier school dinners.